The mechanistic relationships between initiating stimulus, cellular source and sequence of chemokine expression, and leukocyte recruitment during inflammation are not clear. To study these relationships in an acute inflammatory process, we challenged a murine air pouch with carrageenan. A time-dependent increase in TNF-α, monocyte chemottractant protein-1 (MCP-1), macrophage-inflammatory protein-1α (MIP-1α), RANTES, KC, and MIP-2 was found in the exudates preceding cell recruitment, but displaying different kinetic profiles. Air pouches generated for 2, 6, or 9 days before initiating inflammation demonstrated a proportional increase in the number of cells lining the cavities. Two hours after carrageenan stimulation, the synthesis of TNF-α and all chemokines but RANTES increased in proportion to the lining cellularity, although no differences in infiltrating leukocytes were found, suggesting that the early source of these mediators is resident cells. To assess the contribution of neutrophils to chemokine synthesis at later time points, we used neutropenic animals. Neutrophil depletion caused a decrease in TNF-α (51%), KC (37%), MIP-1α (30%), and RANTES (57%) levels and a 2-fold increase in monocytes 4 h after challenge. No effect on MIP-2 and MCP-1 levels was observed. The selective blockade of CXCR2 or CCR1 inhibited neutrophil recruitment by 74% and 54%, respectively, without a significant inhibition of monocytes. A differential effect on TNF-α and MCP-1 levels was observed after these treatments, indicating that the two receptors did not subserve a mere redundant chemotactic role. Overall, our results suggest that chemokines synthesized by resident cells play an important role in the evolution of the inflammatory response. The synthesis of inflammatory mediators is a fundamental mechanism for leukocyte recruitment to an inflamed tissue. Results published in the last decade have clearly demonstrated the involvement of chemokines in this trafficking system (reviewed in Ref. 1), as these mediators contribute to the dynamic process of leukocyte subset recruitment. The successful delivery of the appropriate population of leukocytes to a restricted site of acute inflammation will depend on the repertoire of chemokines synthesized locally and on the temporal expression of chemokine receptors on the leukocytes. During the evolution of an acute, local inflammatory response, peripheral blood neutrophils are the first responder cells to arrive in significant numbers, followed by mononuclear cells. Neutrophil-chemokine interactions are important to this process, because this cell population expresses chemokine receptors, including CXCR2 (2, 3) and CCR1 (4). Furthermore, the blockade of CXCR2 or its ligands, KC and macrophage-inflammatory protein-2 (MIP-2)2 (the murine homologs of human growth-related oncogene-α), has been shown to markedly inhibit neutrophil migration in murine models of infection (5, 6, 7, 8, 9, 10) and inflammation (11, 12), whereas the blockade of CCR1/MIP-1α interactions has been reported to inhibit neutrophil recruitment in specific experimental models (12, 13, 14, 15, 16, 17). Monocytes/macrophages also express a variety of chemokine receptors, such as CCR1, CCR2, and CCR5 (18, 19), even though the majority of research has centered on the role of CCR2/monocyte chemottractant protein-1 (MCP-1) as a major regulator of monocyte trafficking under in vivo pathological situations (20, 21, 22). Resident tissue cells, such as fibroblasts, smooth muscle cells, and epithelial cells, may participate in the evolution of the inflammatory response in part by the synthesis of soluble mediators. A number of in vitro studies have shown that both resident cells (23, 24, 25) and leukocytes (26, 27, 28) may synthesize chemokines after stimulation by proinflammatory cytokines. However, the contribution of resident cells vs recruited leukocytes in the evolution of an acute inflammatory event in vivo is not clear, as increasing evidence suggests that resident, structural cells in the tissue may play a key effector role during inflammation via chemokine synthesis (reviewed in Ref. 29). To explore the role of resident cells in the synthesis of chemokines in an acute inflammatory response, we used the murine air pouch model. In this assay, the local exudates generated after the injection of an inflammatory stimulus can be easily collected, and the cellular and soluble mediators can be analyzed. Furthermore, changes in the timing and the volume of the air injected into the pouches can be manipulated to modulate the amount of resident cells lining this tissue compartment (30). In the present study, we have focused on the role of resident cells in the synthesis of TNF-α and three CC (MCP-1, MIP-1α, RANTES) and two CXC (MIP-2, KC) chemokines during the different phases of the inflammatory response induced by carrageenan. Swiss male mice weighing 25–30 g (Harlan Ibérica, St. Feliu de Codines, Spain) were used throughout these studies. All experimental procedures were previously notified to the regulatory authorities, and guidelines approved by the Catalan Parliament were strictly followed. To generate the air pouch, animals were anesthetized and 6 ml of sterile air was injected s.c. in the back on day 0, followed 3 days latter by a second injection of 3 ml of sterile air (day 3). On day 6, 1 ml of a suspension of 1% carrageenan in saline solution (carrageenan viscarin; FMC, Chicago, IL) was injected into the cavity. Animals were sacrificed at different time points (0, 2, 4, 6, 14, 24, 48, and 72 h) after the carrageenan injection, pouches were washed with 3 ml of PBS, exudates were collected, and total cells were counted. A volume of 1 ml of exudate was centrifuged at 10,000 rpm for 2 min and aliquots were frozen at −80°C until analyzed by ELISA. The levels of chemokines and cytokines were determined using commercial ELISA kits (MIP-1α, RANTES, KC, MIP-2, and TNF-α from R&D Systems, Minneapolis, MN; MCP-1 from BioSource International, Camarillo, CA). Aliquots of the exudates containing 200,000 cells were centrifuged in a Cytospin, air dried, and stained with Diff-Quick (Dade Behring, Deerfield, IL), and the percentage of different cell populations was counted under a microscope. In some experiments, blood from retro-orbital plexus was collected in heparinized tubes at each time point. Blood samples were centrifuged (10,000 rpm for 2 min) and plasma aliquots were stored until analysis of chemokines was performed, as described above. Animals were divided into three groups of 21 mice. Each group received different air volumes in their backs to generate air pouches of 2, 6, or 9 days of evolution. Nine-day-old pouches received 6 ml of air on day 0 and 3 ml of air on both days 3 and 6 and were challenged on day 9. Animals with 6-day-old pouches received 6 ml of air on day 3 and 3 ml on day 6 and were challenged on day 9. Mice with 2-day-old pouches received 6 ml of air on day 7 and were challenged on day 9. To avoid differences in the total number of injections among the different conditions, mice from the 2-day and 6-day groups received injections without air at the appropriate time points. On day 9, three animals from each group that did not receive carrageenan were sacrificed, their backs were shaved and opened with scissors, and skin biopsies of 8-mm diameter were obtained. Biopsies were fixed for 48 h in 10% neutral buffered formalin, embedded in paraffin, cut into 5-μm sections, and stained with H&E according to standard procedures. The remaining mice (18 per group) received an intrapouch injection of 1 ml of carrageenan 1% in saline on day 9. After 2, 4, and 24 h, six animals from each group were sacrificed, exudates were collected, and samples were processed and analyzed as described. Animals with standard 6-day-old air pouches received an i.p. injection of 0.1 mg of a purified rat anti-mouse Ly-6G (Gr-1) mAb (clone RB6-8C5; BD PharMingen, San Diego, CA) (31) or the corresponding isotype (rat IgG2b,κ) 18 h before carrageenan 1% challenge. The exudates were collected 4 h after challenge, processed, and analyzed as described. This treatment has been shown to deplete neutrophils in a variety of bacterial and fungal provocation models in vivo (8, 32, 33). We administered i.p. 0.5 ml of a goat anti-CXCR2 antiserum (a generous gift from R. M. Strieter, Department of Medicine, Division of Pulmonary and Critical Care Medicine, University of California, Los Angeles, School of Medicine, Los Angeles, CA) or normal goat serum to mice with 6-day-old air pouches. This protocol has been previously reported to block ligand binding to CXCR2 in in vivo studies (8). The selective CCR1 receptor antagonist, compound 2q, recently disclosed by researchers from Banyu Pharmaceutical (Tokyo, Japan) (34), was synthesized in house, suspended in methyl-cellulose (0.25%) and Tween 80 (0.05%), and injected via an i.p. route to mice with 6-day-old air pouches at a dose of 10 mg/kg. Control animals received vehicle alone. This compound has been reported to block both human and murine CCR1 (34). Two hours after the anti-CXCR2 or 30 min after the CCR1 antagonist administration, 1 ml of carrageenan (1%) was injected into the pouches, and 4 h later animals were sacrificed, exudates were collected, and samples were processed and analyzed as described. In a subset of experiments, the CCR1 antagonist was administered either to neutropenic mice or to mice pretreated with the anti-CXCR2 antiserum, and 30 min later, carrageenan 1% was injected into the pouch. Exudates were collected 4 h later and the levels of MCP-1 were analyzed as described. Mice with 6-day-old pouches received an intrapouch injection of 1 ml of carrageenan 1% and were divided into three groups of eight mice each. The first group received vehicle by i.p. route 30 min later and 0.5 ml of PBS intrapouch 60 min later. The second group received vehicle by i.p. route and 0.5 μg of MIP-1α/0.5 ml of PBS intrapouch, and the third group received 10 mg/kg of the CCR1 antagonist by i.p. route and the same amount of MIP-1α intrapouch, at the corresponding time points. Two hours after MIP-1α or PBS injection, mice were sacrificed and MCP-1 contents in the exudates were measured as described. Mice with 6-day-old air pouches were sacrificed before or 4 h after carrageenan injection. The backs of the mice were shaved and 8-mm skin biopsies were obtained and homogenized in TRIzol reagent (Life Technologies, Grand Island, NY), according to manufacturer’s instructions. In parallel samples from the same mice, explants from the skin biopsies were seeded on 24-well plates. Three days later, explants were removed, and 5 days later, confluent primary cultured fibroblasts were obtained. The purity of fibroblasts was assessed by microscopic examination of parallel samples grown on culture slides (Falcon; BD Biosciences, Franklin Lakes, NJ) and stained with H&E. Total RNA was extracted from sample tissue homogenates and cultured fibroblasts using a modification of the method described by Chomczynski and Sacchi (35) (TRIzol LS Reagent; Life Technologies). The precipitated mRNA was suspended in RNase-free water and quantitated by spectrophotometry, and samples were kept at −80°C until analysis. The RT-PCR was performed in a single step using the Access RT-PCR System (Promega, Madison, WI). The incubation mixtures contained 1 μg of total RNA from cells or tissue samples plus 1 μM oligonucleotides in a final volume of 50 μl. Reactions were performed in a thermocycler (Gene Amp PCR System 9700; Applied Biosystems, Foster City, CA) using conditions adjusted to be in the exponential phase of amplification for each sample and its corresponding GAPDH control. The murine sequences for the primers were as follows: CXCR2, 5′-TGTTCTTTGCCCTGACCTTGC-3′ (sense) and 5′-ACGCAGTACGACCCTCAAACG-3′ (antisense); CCR1, 5′-AGCCTACCCCACAACTACAGAA-3′ (sense) and 5′-CTTGTAGGGGAAATGAGGGCTA-3′ (antisense); CCR2, 5′-AATATGTTACCTCAGTTCATCCAC-3′ (sense) and 5′-ACCAAAGATGAATACCAGGGA-3′ (antisense); CCR5, 5′-TACCAGATCTCAGAAAGAAGTTTTCATTA-3′ (sense) and 5′-GCGTTTGACCATGTGTTTTCGGAAGAACACT-3′ (antisense); and GAPDH, 5′-TGAAGGTCGGTGTGAACGGATTTGG-3′ (sense) and 5′-CAAAGTTGTCATGGATGACC-3′ (antisense). Twenty microliters of PCR mixtures were visualized on 2% agarose minigels by ethidium bromide staining. The predicted sizes of PCR products were confirmed by comparison with a DNA ladder run in a parallel lane on the same gel. Results depicted are the average of individual animal data obtained in two to three independent experiments using six to eight animals per time point per group in each experiment and are expressed as the mean ± SEM. Student’s t test (GraphPad Prism software; GraphPad, San Diego, CA) was used to determine whether differences observed were significant. A p value <0.05 was considered statistically significant. The injection of carrageenan into the air pouch induced a time-dependent increase in leukocyte infiltration and in TNF-α and chemokine levels in the exudates (Fig. 1⇓). Neutrophils were the predominant cell type at all time points, followed by monocytes, in agreement with previous results (36). A rapid and significant increase of 7-fold in the number of neutrophils was found in the exudates from 2 to 4 h, whereas the main increase in monocytes (∼10-fold) occurred from 4 to 24 h. The recruitment of both leukocyte subsets reached its maximum between 14 and 24 h and declined thereafter from 24 to 72 h.
Time course of infiltrating leukocytes and of TNF-α and chemokine synthesis in the exudates of mice with 6-day-old air pouches treated with 1% carrageenan (n = 12 mice per time point per group; from two independent experiments). An analysis of the time course of chemokine expression demonstrated that a significant increase in both CC (MCP-1 and MIP-1α) and CXC chemokines (KC and MIP-2) was induced at early time points after challenge (2 h) and peaked at ∼6 h poststimulation. KC and MIP-1α showed a similar kinetic profile, with low levels present at the 24-h point. The expression of MIP-2 was more transient, with no levels found after 14 h. Interestingly, the two CC chemokines, MCP-1 and RANTES, displayed a different expression pattern. RANTES was the only chemokine whose levels were undetectable before the 4-h time point. MCP-1, although induced shortly after challenge, displayed a sustained production from 6 to 24 h. The levels of both chemokines declined from 24 to 72 h, mimicking the evolution of infiltrating cells. The kinetics of TNF-α production suggested that this cytokine played a role in the synthesis of chemokines involved in the subsequent cell recruitment. The different kinetic profiles observed among some chemokines could be explained by differences in the mechanism of regulation of their synthesis, the cellular source responsible for their production, or both. The analysis of chemokine levels in the plasma of the control, unchallenged animals revealed low levels of KC (0.2 ng/ml) and MCP-1 (0.4 ng/ml). However, after the injection of carrageenan, plasma contents of KC, MCP-1, and also RANTES increased with time, reaching maximum at 24 h (6, 0.7, and 0.5 ng/ml, respectively). MIP-2 was found in plasma only at 2 h after carrageenan (0.05 ng/ml), and no detectable levels of MIP-1α were found in plasma at any time point. These results suggest that the local inflammatory response influences mediator levels found in the systemic circulation through the generation of chemokine diffusion gradients from the affected tissue to blood. The presence of significant amounts of TNF-α and both CXC and CC chemokines in the exudates shortly after carrageenan injection suggested that resident cells were involved in their synthesis. To address this point, we generated air pouches that were allowed to evolve for 2, 6, or 9 days before challenge. Previous studies in the rat had shown that the age of the air pouch had an impact on the amount of local resident cells lining the cavities (30). As shown in Fig. 2⇓, histological sections of mouse skin biopsies showed that the thickness of the conjunctive tissue layer increased significantly with the days of evolution of the pouch. In the three conditions tested, the conjunctive tissue was composed mainly of fibroblasts and lower numbers of resident macrophages, in agreement with results reported in the rat (30). Histological sections of skin biopsies obtained from mice with air pouches of 2, 6, and 9 days of evolution. Images are representative of three independent experiments. The 6-day-old pouch picture (center) corresponds to the standard protocol used throughout these studies. Mice with air pouches of different ages were challenged with 1% carrageenan, and total leukocytes and mediator levels were analyzed 2, 4, or 24 h later. The results obtained in the 6-day group in this set of experiments did not differ significantly from those depicted in Fig. 1⇑ at the corresponding time points. For that reason, to avoid the unnecessary repetition of data, only results obtained in the 2- and 9-day groups are shown. A small number of infiltrating cells was found in the exudates 2 h after challenge that was not statistically different between the two groups (Fig. 3⇓). However, the levels of TNF-α, KC, MIP-2, MCP-1, and MIP-1α were found to increase significantly with the age of the pouch. The increase was especially dramatic for KC (6-fold) and MIP-2 (4-fold), whereas it was less pronounced for MCP-1, MIP-1α, and TNF-α (from 2.2- to 2.4-fold). Again, no detectable levels of RANTES were found at 2 h. These results indicate that at early time points resident cells play a major role in the synthesis of TNF-α and CXC and CC chemokines, with the exception of RANTES. Effect of the age of the pouch (2 days or 9 days of evolution) on inflammatory cell recruitment and on TNF-α and chemokine synthesis in the exudates at different time points after 1% carrageenan injection (n = 14 mice per time point per group; from two independent experiments). ∗, p < 0.05; ∗∗, p < 0.01; p < 0.005; 2 days vs 9 days at each time point; Student’s t test. Results obtained in the 6-day group (standard protocol) are not shown here because they are essentially the same as those depicted in Fig. 1⇑ at 2, 4, and 24 h.
The differences in chemokine levels between the two groups at 2 h translated in a differential increase in cell recruitment at 4 h. In the 2-day group, an increase of 3.5-fold in leukocyte number was accompanied by a parallel increase in MIP-1α and detectable RANTES levels. The production of MCP-1 and KC was maintained, whereas that of MIP-2 and TNF-α declined. In the 9-day-old group, the 8.5-fold increase in leukocytes was associated with a statistically significant increase in all chemokines and a sustained production of TNF-α in the same period. Thus, at this time point, the contribution of leukocytes to the synthesis of some mediators could not be ruled out. Both the number of recruited cells and the levels of MCP-1 and RANTES at 24 h after challenge increased significantly with the age of the pouch. Low or undetectable levels of the other mediators were found at this time point, in agreement with the results obtained in the time course studies in mice with 6-day-old pouches. To determine the role of neutrophils, the main cell type in the exudates, on the synthesis of the different mediators, we used neutropenic animals. Mice with 6-day-old air pouches were treated with an anti-Ly-6G Ab to deplete circulating neutrophils. As shown in Fig. 4⇓, neutrophils were absent from the exudates 4 h after carrageenan injection, but a 2-fold increase in the number of monocytes was found. The depletion of neutrophils was associated with a statistically significant reduction in the levels of TNF-α, KC, and MIP-1α, indicating that these cells contribute to their synthesis. No effect on MIP-2 and MCP-1 levels was found. The reduction in RANTES levels observed in neutropenic mice, although of a considerable magnitude, did not reach statistical significance because of the high intra- and interassay variability in the levels of this chemokine. Effect of neutropenia on infiltrating cells and on TNF-α and chemokine levels in the exudates of mice with 6-day-old pouches, 4 h after 1% carrageenan (n = 12 mice per group; from two independent experiments using six animals). ∗, p < 0.05; ∗∗, p < 0.01; ∗∗∗, p < 0.005; isotype vs anti-Ly; Student’s t test. Our results had shown that the murine ligands for CXCR2 (KC, MIP-2), CCR1 (MIP-1α), and CCR2 (MCP-1) were produced before neutrophil recruitment in the exudates. Because neutrophils have been shown to express CXCR2 and CCR1 (2, 3, 4), we wanted to explore the impact of the selective blockade of these receptors in our system. We studied the effect of a specific neutralizing Ab to murine CXCR2 (8) and a small m.w. antagonist of both human and mouse CCR1 (34) on the production of TNF-α, chemokines, and the subsequent infiltration of leukocytes 4 h after challenge. Treatment of mice with the anti-CXCR2 neutralizing antiserum or the CCR1 antagonist caused a reduction of neutrophils of 74% and 54%, respectively, and a non-statistically significant reduction of monocytes (Table I⇓). Higher doses of the CCR1 antagonist (30 mg/kg) did not cause a superior inhibition of cell recruitment (data not shown). In our hands, this compound did not induce neutropenia in normal mice in vivo and was not cytotoxic for mouse blood cells in vitro (n = 10; data not shown). Furthermore, the compound blocked the calcium responses induced by MIP-1α, but not those induced by KC, MIP-2, or MCP-1 in mouse bone marrow cells in vitro (n = 3; data not shown). No response to RANTES was found in control samples. These results indicated that the effect of the compound in our model was due to the selective antagonism of murine CCR1. The blockade of CXCR2 moderately but significantly inhibited MIP-1α and TNF-α levels, whereas the blockade of CCR1 reduced MCP-1, MIP-1α, and TNF-α. A non-statistically significant inhibition of RANTES and no effect on KC and MIP-2 was observed in both situations. The decrease in MCP-1 levels after CCR1 blockade could not be simply explained as the consequence of the inhibition of neutrophil recruitment, because it was not observed in neutropenic or anti-CXCR2-treated mice. Moreover, the fact that neutropenia and CXCR2 blockade shared the same lack of effect on MCP-1 despite their opposite effect on monocyte recruitment suggested that these cells were not the main source of MCP-1. When the CCR1 antagonist was administered before the carrageenan challenge either to neutropenic or anti-CXCR2-treated mice, the inhibition of MCP-1 was unaffected (49 and 44% of inhibition, respectively; data not shown), confirming that this effect was unrelated to the presence of neutrophils and was not unmasked by CXCR2 blockade. At the doses used, the combination of the anti-CXCR2 plus the CCR1 antagonist caused the same inhibition of neutrophil recruitment as the anti-CXCR2 alone (data not shown). We hypothesized that the CCR1 present in resident cells played a role in the regulation of MCP-1 synthesis. 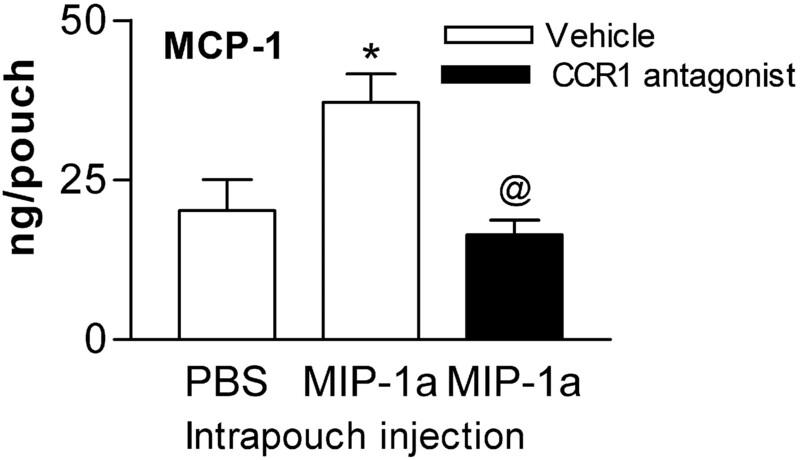 To explore this possibility, we next studied whether the intrapouch injection of MIP-1α induced the synthesis of MCP-1 and whether this effect was blocked by the CCR1 antagonist. Because no effect on MCP-1 was observed with the injection of MIP-1α alone (data not shown), we performed the experiment in animals pretreated with carrageenan. The injection of MIP-1α 1 h after carrageenan caused a significant increase in MCP-1 in comparison with animals receiving PBS (Fig. 5⇓). Furthermore, the preadministration of the CCR1 antagonist abolished the increase in MCP-1. These results indicate that MIP-1α can induce MCP-1 synthesis and that this effect is mediated, directly or indirectly, by CCR1. Effect of the CCR1 antagonist on the MCP-1 levels induced 2 h after the intrapouch injection of PBS or 0.5 μg of MIP-1α (n = 8 mice per group). Mice were treated for 1 h with 1% carrageenan before PBS or MIP-1α injection. ∗, p < 0.05; MIP-1α vs PBS; @, p < 0.05; CCR1 antagonist vs vehicle; Student’s t test. Our previous studies showed that resident cells are an important source of chemokines. To determine whether these cells can also respond to these mediators, we studied the expression of the chemokine receptors whose ligands were present in the exudates: CXCR2, CCR1, CCR2, and CCR5. Homogenates from both skin biopsies (all resident cell types) and isolated fibroblasts (the predominant cell type in the air pouch lining) were obtained from animals with 6-day-old pouches at time 0 (blank controls) or 4 h after carrageenan challenge. As depicted in Fig. 6⇓, RT-PCR studies demonstrated that resident tissue homogenates express mRNA coding CCR1, CCR2, CCR5, and CXCR2 both constitutively and after stimulation. In resident fibroblasts, CCR1, CCR2, and CCR5 were also expressed under the two conditions tested. Interestingly, fibroblasts did not express CXCR2. 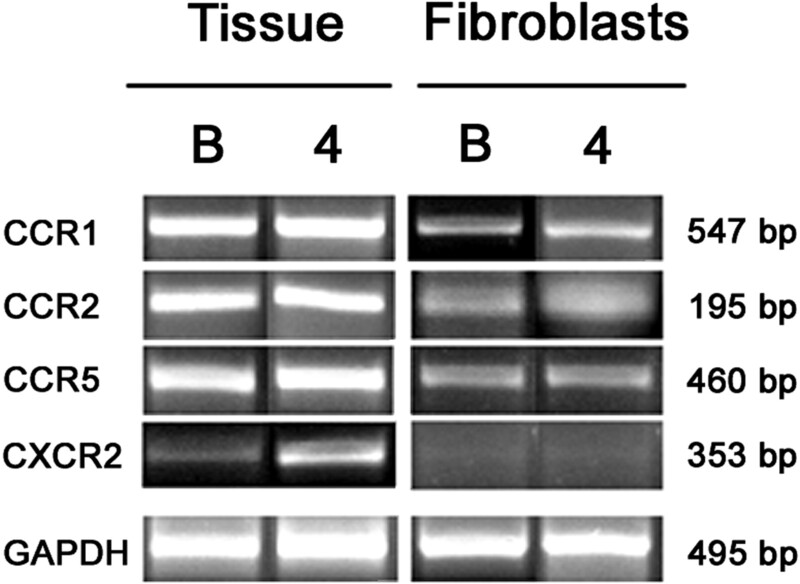 Preliminary results using biotinylated chemokines have revealed the presence of specific binding sites for MIP-1α and MCP-1 on the surface of fibroblasts by FACS analysis (data not shown). These results indicate that chemokines can potentially signal though resident cells. RT-PCR of chemokine receptors from whole skin tissue homogenates or cultured fibroblasts from the air pouch lining obtained from mice with 6-day-old pouches either before (B) or 4 h after (4) 1% carrageenan injection. This picture is representative of three independent experiments performed in triplicate. GAPDH is included as the housekeeping gene. Of the myriad of mechanisms that support the host’s initial defense system, none is more important than the successful recruitment of leukocytes from the lumen of a vessel to an area of inflammation. This seemingly simple event is supported by a sophisticated process of cytokine cascades, cell-to-cell communication, and the expression of redundant chemotactic mediators that collectively aid in the delivery of specific leukocyte subpopulations to a restricted area of tissue injury. The importance of this process is underscored by the fact that defects in leukocyte recruitment can lead to a state of immunosuppression (37, 38). As the various mechanisms of leukocyte recruitment are identified, it is becoming clear that the dynamic event of cell migration is not restricted to leukocyte-endothelial cell interactions, but is directed in large part by cells that comprise the resident tissue in the inflamed area, including stromal, epithelial, and endothelial cells (23, 24, 25, 39). Data from the set of studies contained in this investigation demonstrate that resident tissue cells are a significant component of the initial localized in vivo response, a reaction that is dictated by the sequence of cytokine-chemokine expression. In our studies, we used an established model of acute inflammation, the 6-day-old murine air pouch followed by carrageenan challenge, to assess specific cellular and mediator parameters that serve as mechanisms for leukocyte recruitment. In our studies, we found that the challenge set in motion a rapid expression profile of TNF-α and chemokines that was observed before a significant leukocyte infiltration. Two hours after challenge, peak levels of TNF-α were already achieved coincident with significant levels of KC, MIP-2, MCP-1, and MIP-1α. The kinetics of TNF-α synthesis in the air pouch are similar to those found in other acute models of inflammation and are likely derived mainly from the local tissue macrophages. The role of TNF-α in the induction of chemokine synthesis in this model is supported by the fact that the intrapouch injection of TNF-α leads to both chemokine synthesis and leukocyte recruitment (40). However, the participation of other cytokines such as IL-1 (41) or IL-6 (42) in chemokine synthesis cannot be discarded. 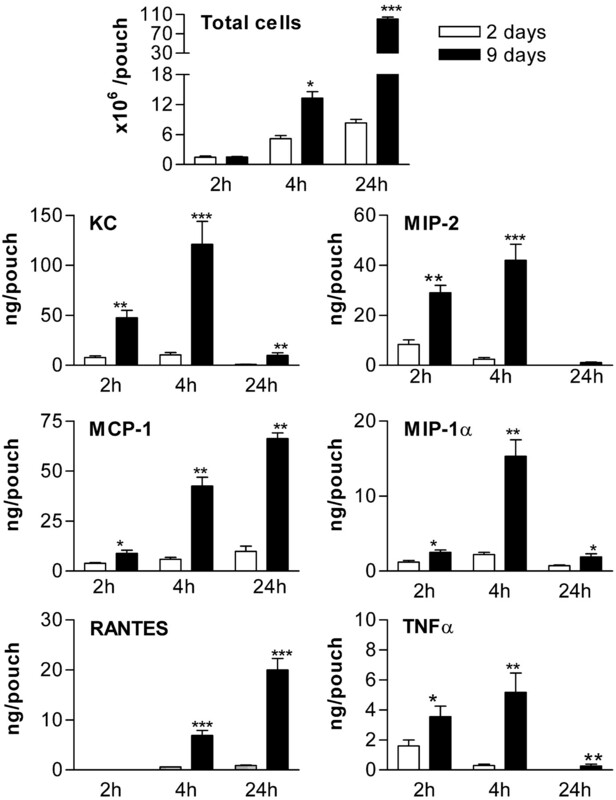 At the 4-h time point, when KC, MIP-2, and MIP-1α were near the zenith of their expression profiles, neutrophil elicitation was significant (∼10 million cells/pouch) and RANTES production was evident. Thus, whereas resident cells were probably the main source of mediators present at 2 h, infiltrating cells could be an additional source of chemokines at later time points. However, between 6 and 24 h after challenge, there was an inverse correlation between the levels of TNF-α, KC, MIP-2, and MIP-1α and the number of recruited cells, suggesting that leukocytes directly or indirectly contribute to the down-regulation of their synthesis at later time points. This could be due to the clearance of the driving stimulus (carrageenan) by neutrophil phagocytosis and/or to the production of anti-inflammatory mediators by these cells. Interestingly, human neutrophils have been reported to synthesize IL-1 receptor antagonist and TNF-α soluble receptors that increase with cell density and cause the down-regulation of IL-8 production (43). The down-regulation of chemokine synthesis would provide a feedback mechanism to control further cell recruitment and activation that could eventually lead to tissue damage. 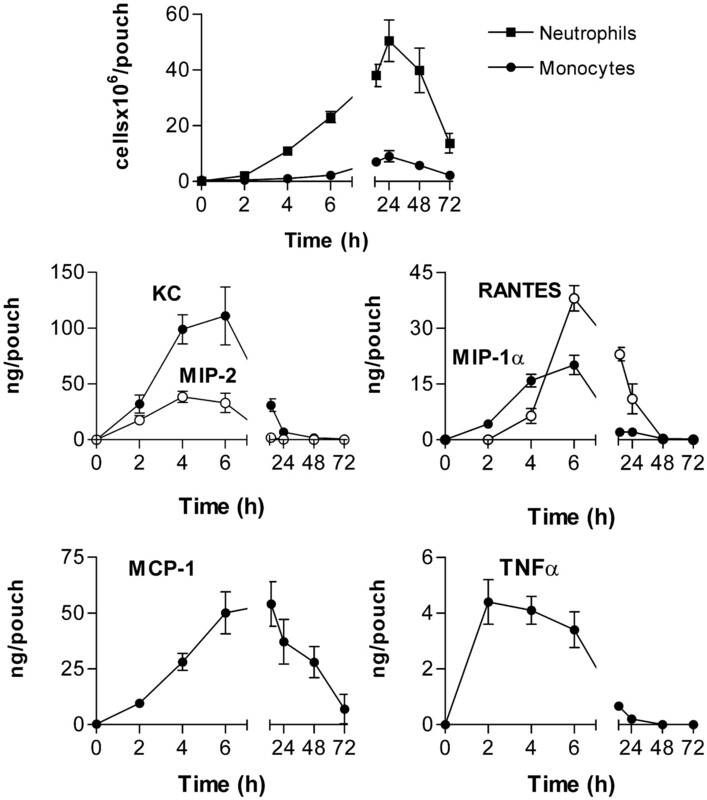 The comparison of the timing of expression of the different chemokines with the recruitment of the two cell subsets indicates that the two CXC chemokines as well as MCP-1 and MIP-1α may play a role in neutrophil mobilization, whereas MCP-1 and RANTES are more likely to be involved in the subsequent mononuclear cell infiltration. To explore the role of resident cells in the production of TNF-α and chemokines, we next altered the model in a manner which would modify the number of resident structural cells in the inner surface of the pocket. Subsequent inflammatory challenge to air pouches of different days of evolution resulted in a rapid increase in TNF-α, KC, MIP-2, MCP-1, and MIP-1α that correlated with the resident cell population found in the lesion, but not with the number of infiltrating cells. These results confirmed that resident cells are the main source of the mediators involved in the early neutrophil recruitment. Furthermore, the important differences found both in mediator levels and in the number of recruited cells in the two conditions at 4 and 24 h support the view that the initial response provided by resident cells dictates the evolution of the system. The contribution of neutrophils to chemokine synthesis in the amplification phase of the response (exemplified by the 4-h time point) was studied using neutropenic mice. Our results suggest that neutrophils contribute either directly or indirectly to the production of TNF-α, KC, MIP-1α, and probably also RANTES. 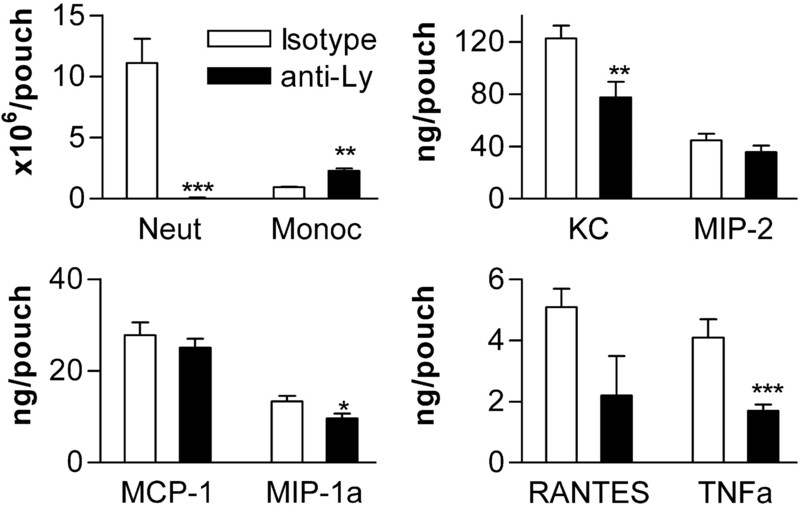 The lack of effect of neutropenia on MIP-2 and MCP-1 levels suggests either that neutrophils do not play a role in their synthesis or that the inhibition due to neutrophil depletion is compensated by resident cells and/or infiltrating monocytes. The chemokines KC/MIP-2 and MIP-1α were likely involved in the recruitment of neutrophils in the exudates by binding to CXCR2 and CCR1, respectively. The role of CXCR2 in neutrophil recruitment has been consistently reported (5, 6, 7, 8, 9, 10, 11, 12), but the role of CCR1 remains controversial. Although CCR1 or MIP-1α deficiency has been shown to inhibit neutrophil migration in some models (13, 14, 16), a lack of effect has been reported in other studies (7, 44). Furthermore, CXCR2 and CCR1 ligands have been described to exert unique roles in biological processes such as apoptosis (45) and phagocytosis (46), respectively. To determine whether these two receptors displayed redundant or unique roles in our system, we blocked their function using an anti-CXCR2 Ab or a selective CCR1 antagonist. Our results showed that both receptors had a partial overlapping effect in neutrophil recruitment. A trend toward a decrease on monocyte recruitment was also observed after CXCR2 blockade. The effect of the anti-CXCR2 Ab on the production of the different mediators agreed with the results found in neutropenic mice, when their effects on neutrophil recruitment were compared. The lack of a significant inhibition of KC after CXCR2 blockade suggests that the contribution of neutrophils can be fully compensated by another cell source unless total neutrophil suppression is achieved. The CCR1 antagonist did not affect the levels of CXC chemokines but significantly inhibited TNF-α, MCP-1, and MIP-1α production. The inhibition of TNF-α after CCR1 blockade was approximately 2-fold higher than that attained with the anti-CXCR2 Ab, despite its lower effect on neutrophil recruitment. This suggested that CCR1 was not only involved in chemotaxis, but also in cell activation. These results would be in agreement with the fact that MIP-1α, the CCR1 ligand, has been reported to induce the synthesis of TNF-α, IL-6, and IL-1 in thioglycollate-elicited peritoneal macrophages (47). The finding that only the CCR1 antagonist inhibited MCP-1 synthesis was intriguing. The same inhibition was observed when this compound was administered to either neutropenic or anti-CXCR2-treated mice, despite the different effects of both treatments on monocyte recruitment. These observations suggested that neither neutrophils nor monocytes were the cellular target for this effect. We hypothesized that the CCR1 present in resident cells was involved in the regulation of MCP-1 synthesis. We demonstrated that the injection of exogenous MIP-1α caused a significant increase in MCP-1 levels in the exudates, which was blocked after administration of the CCR1 antagonist. However, MIP-1α did not increase MCP-1 levels when injected in the absence of carrageenan (data not shown), suggesting that factor(s) other than MIP-1α are needed for this effect to occur. Of note, in another model of acute inflammation, the i.p. injection of LPS to mice, the plasma levels of MCP-1 were only inhibited in animals treated with the CCR1 antagonist, but not in those treated with the anti-CXCR2 Ab (N. Godessart, unpublished observations). Resident cells not only synthesize chemokines but they may also respond to these mediators. Our studies showing the expression of mRNA-coding chemokine receptors in resident skin cells and in particular fibroblasts (CCR1, CCR2, and CCR5) indicate that both CXC and CC chemokines can potentially signal on resident cells and modulate different biological activities. An interesting example of this regulation is the induction of matrix metalloprotease 1 production by MCP-1 on fibroblasts (48). Studies to determine the effect of chemokines on resident cells are in progress. Several in vitro studies have clearly demonstrated that stromal cells, endothelial cells, and epithelial cells express inflammatory mediators, including bioactive lipids, peptides, and polypeptides. The potential mechanisms whereby these structural cell-derived mediators may participate in the inflammatory response are multiple. These cells may block leukocyte apoptosis via fibroblast-derived CSFs, increase vascular permeability via fibroblast- or macrophage-derived PGE2, or initiate leukocyte recruitment via chemokine expression. The set of experiments detailed in this study was designed to assess the role of resident cells as major participants in the initiation of leukocyte elicitation to a restricted area of inflammation. Our results demonstrate that the evolution of an acute inflammatory response is driven by a multifactorial system in which chemokines play an important role. In normal situations, the response of resident cells to an initial stimulus rapidly sets in motion a sequence of leukocyte-recruiting events that culminates in the clearance of the foreign agent and the resolution of the response. The disregulation of this process might explain the sustained recruitment and activation of leukocytes found in pathological conditions such as autoimmune diseases (reviewed in Ref. 49). We acknowledge Robert M. Strieter for kindly providing the anti-CXCR2 antiserum, Encarna Jiménez for her excellent technical assistance, and both María Prats and Maribel Crespo (Medicinal Chemistry Department of Almirall Prodesfarma) for the synthesis of the CCR1 antagonist. 2 Abbreviations used in this paper: MIP, macrophage-inflammatory protein; MCP, monocyte chemottractant protein. Fahey, T. J., III, K. J. Tracey, P. Tekamp-Olson, L. S. Cousens, W. G. Jones, G. T. Shires, A. Cerami, and B. Sherry. 1992. Macrophage inflammatory protein 1 modulates macrophage function. J. Immunol. 148:2423.